These guys have been friends of Bromsgrove Folk Club and Festival for quite a while now.....because they tick all of the Bromsgrove boxes - fine musicians, live music, folk (use your imagination), great audience rapport but most of all GREAT ENTERTAINMENT!!! Their "tag line" is Eclectic Acoustic Vaudeville! and Boy! Do they live up to it! 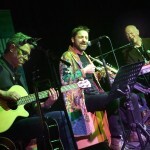 Individually the comprise three three of the Midlands most experienced gigging musicians – Oliver Carpenter, Chris Lomas and Phil Bond – MumboJumbo throws them together in a broadly acoustic format and lets them deliver what they are best at – live music performance. They play around 85% of their own music, and the writing is so good that they were nominated in the British Blues Awards in the Best Original Song category for their track ‘Nice Work’. Amother really great night in prospect......and it's St Valentine's Day!